Demag electric chain hoists. 125kgs SWL to 4 tonnes. 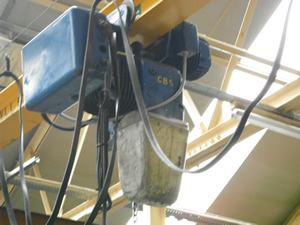 Demag's first ever chain was the PK type electric chain hoist. The PK range has 4 types of hoists: PK1N for 125kgs and 250kgs, PK2N for 250kg and 500kg, PK5N 500 kilos and 1 tonne, and the PKN10 for 1t, 2t, 3t and 4t. Various suspension options are available on Demag's PK hoists. Push, powered and eye suspension. with various lifting heights. The slack chain is housed inside either a plastic or steel slack chain collecting box, (SCCB).